Our Favorite Lunch Boxes and Reusable Bags – Great lunch packing gear makes packing school lunches just a bit easier. These are the best kids’ lunch boxes and reusable bags we’ve tried, plus the pros and cons of each. Thank you so much for the amazing response to yesterday’s big school lunches post! In it, I shared 2 weeks of ideas and a free printable cheat sheet to make lunch packing a breeze. Today, I wanted to talk all about lunch packing GEAR. Which lunch boxes we like, which reusable bags we use, and how I keep from losing all our forks and spoons at school. 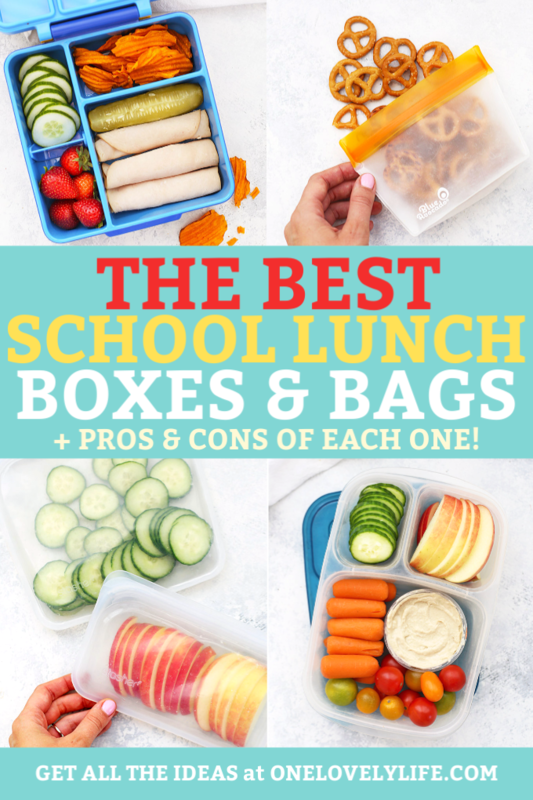 Whether you’re packing lunches for little kids, big kids, or grown-ups, I’ve got picks for all kinds of budgets, ages, and stages, along with a pro and con list for each one. Let’s jump in! 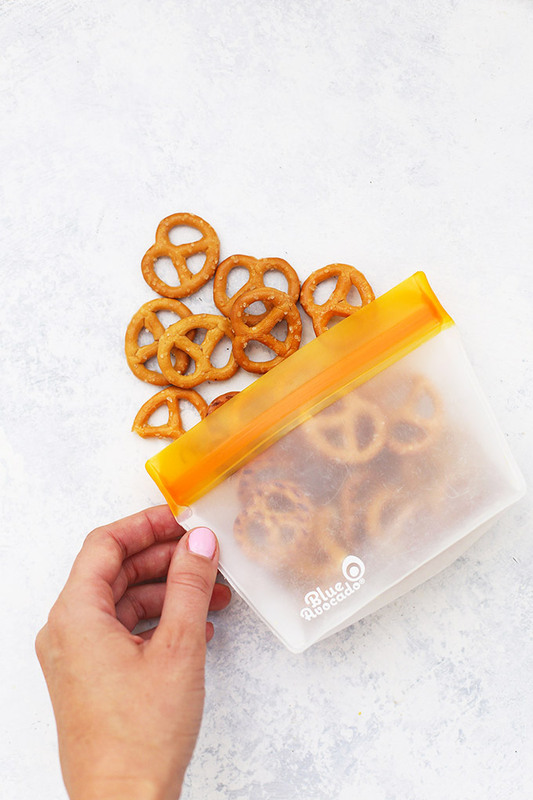 The OmieBox has separately insulated compartments so you can store hot AND cold things in the same lunchbox and it’ll keep each one at the right temperature. The insulated insert is removable. The thermos insert (you can use for soups, pasta, yogurt, etc.) is removable, so you can totally use that area for a sandwich or a bento-style lunch instead. Thermos is airtight. The thermos has an easy screw on/off lid that is airtight, so there’s no sloshing. Both kids can open the thermos with any problem at all. Easy to Open – Milo (5) and Sophie (7) can open these with ease, which means they don’t need to wait for a lunch attendant to help them in the cafeteria. They come with a removable divider, so you can adjust the left side compartment to be the right size for what you’re packing. They sell replacement/spare parts on their site, so if something gets lost or you’d like an extra of something, they’re readily available. They’re cute. Well, they are! Price. 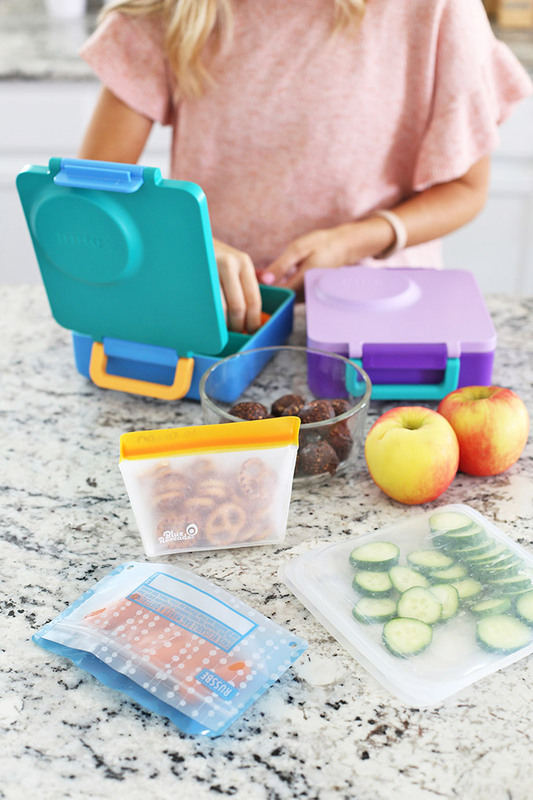 They’re definitely more of an investment than the Easy Lunchboxes (see below), so they’re more of a risk if you have a child who tends to lose things. Washing. The care instructions say that they’re dishwasher safe on the top rack but they recommend hand drying instead of steaming. I’ve just been hand washing them since they take up more space in the dishwasher than I tend to have at the end of the day. They need an ice pack. If you’re not putting these into a refrigerator, you’ll need to pack an ice pack with them, which means putting them into an external lunch box. We’ve found they fit into most kids’ size lunch boxes. See the Omie Boxes in action and get 2 WEEKS of school lunch ideas + a free printable lunch packing cheat sheet here. These Easy Lunchboxes have been our family go-to for about 5 years. Michael and the kids have used 2 sets in that time and they’ve been a really reliable choice. We still have them and they’re in great shape. They’re absolutely my top recommendation if you’re on a budget, have a lot of children, or have kids who tend to lose things. They’re inexpensive. You can get a set of 4 for about $14, so I love that we can have an extra set on hand. They also aren’t too painful to replace if your little one loses their lunchbox at school or leaves it on the bus. They’re dishwasher safe. I love that I can toss the dirty ones in the dishwasher and use the spare set for the next day’s lunch. Fewer dishes = happier me. They also don’t take up as much space in the dishwasher as some other boxes do. Great layout & size. 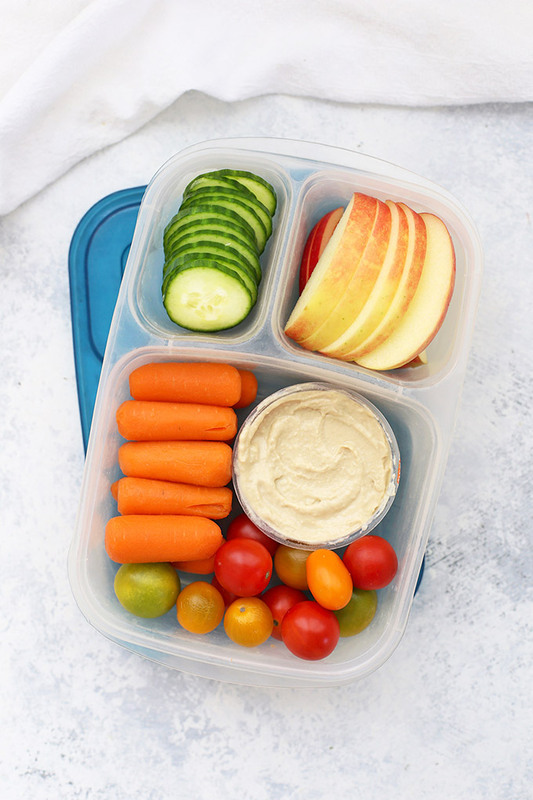 The largest compartment is large enough for a sandwich or leftovers from the night before, while the side compartments can hold fruit, veggies, chips, trail mix, etc. I think they’re a great size for the amount of food my kids typically eat at lunch. Stackable. These can be stacked to save space in a cupboard or drawer, which I LOVE. Easy to open. These are made to be opened by children, so the lids come off easily. This is GREAT in a lot of ways (no struggling to open the containers!) but does have a downside, too (see below). Spill Risk – They’re designed to be easy-open which means they don’t have a vacuum seal. If you pack anything super messy (i.e. putting yogurt in one of the compartments, etc.) you run the risk of a spill if your child’s lunchbox drops or gets flipped over. This has only happened to us a few times, but it does happen. No temperature control. These aren’t insulated, so they do require an ice pack to keep things cold and they can’t keep things warm unless you pack a separate thermos. 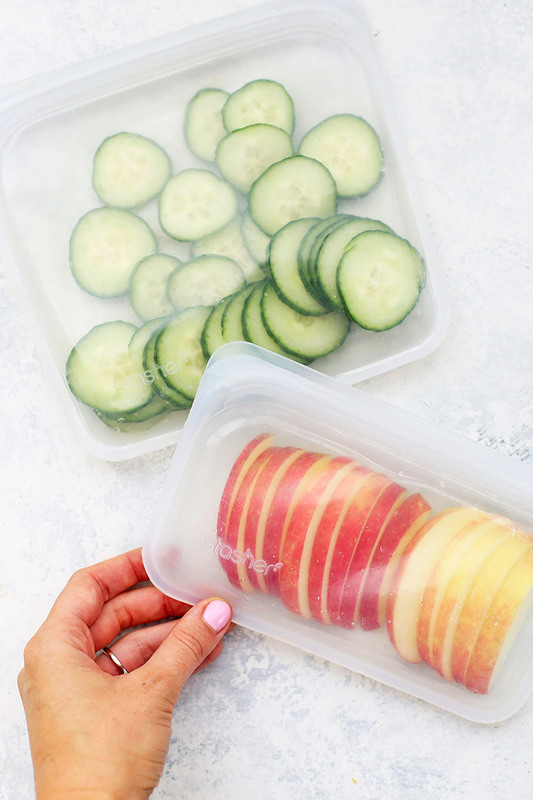 Since not everyone who packs a lunch is a child, I wanted to be sure to include these 2-compartment or 3-compartment glass containers for any adults packing lunches for work or meal prep. We don’t send them to school with the kids, but Michael and I use them all the time. They’re a fantastic option for prepping lunches yourself, or if you’re sending something to a preschool or daycare where an adult will be helping. They’re glass, so they’re nonporous. That means they won’t hold on to colors, odors, or flavors. There’s no spaghetti sauce stains or curry smells that’ll hang on long after you wash them. They’re oven, dishwasher, microwave, and freezer safe. Bam. What else do you need? Just be sure you remember the LIDS aren’t to go in the oven or microwave. Also, follow standard practices for freezing and don’t over-fill them (since foods/liquids often expand upon freezing). The lids are BPA free and clip on and off easily. They come in multiple layouts. You can get 3-compartment or 2-compartment containers. (They also sell single compartment containers, but I don’t prefer those). That gives you some flexibility while packing. The lids aren’t oven/microwave safe. This never bothers me, but it is something to remember. I bought several kinds of bags to test over the summer. These were a new buy for us, and I LOVE THEM. You can find them in lay-flat or stand-up varieties. We have the stand-up ones, and I REALLY love and recommend them. The snack-size bags are a great size for the snacks we send to school with the kids each day. Easy to order. I can find them at Amazon, or at ThriveMarket. Price. They’re not too pricey for reusable bags! Hard to label. We’ve written the kids names on them in permanent marker several times, and it always comes off after a few days. Not a big deal, but is a factor to consider if that’s going to annoy you. Kids sometimes need help to close them. They’re super easy to open, but Milo (5) has needed help to close his each night when we pack his snack for the next day. I think he’ll learn how to do it alone, soon, but he needs help in the meantime. 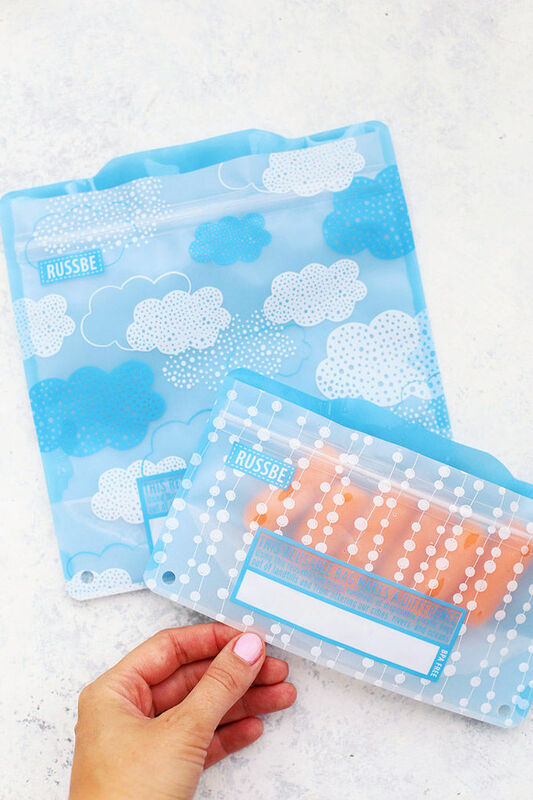 We’ve used these Russbe bags for the last 4 years and just LOVE them. I get a new set each year since they tend to wear out after daily use (we use them at least 5 days a week almost every week of the year), but a single set will last our family a whole year. They’re cute! : These come in a bunch of cute prints and styles. My kids love that. Long-lasting. We’ve only had one rip in all 4 years we’ve been using them. Easy to Label. I only have to re-label the bags every few months with a permanent marker. Pretty easy to open. They open well for both kids, though there was an initial learning curve when they were 3-4. Easy to order. I get them at Amazon, but I’ve also ordered from their site, which has more choices and sometimes offers sales. Sometimes have to pay for shipping. Depending on what’s in stock, you may have to pay for shipping, which increases the overall cost. Kids sometimes need help to close them. Similar to the (Re)Zip bags above, kids sometimes need help to close these when packing. Neither child has had trouble opening them. Availability. I’ve found that the stock isn’t as dependable with these. Sometimes there are a TON of choices, sometimes, stock is pretty limited. We’ve been using these Stasher Bags for the last 3 months or so, and they’re SO HANDY to have in the kitchen. I have the snack size and sandwich bags and really like both. (I actually profiled these a bit in this month’s favorite things post!) We use them more for the prep side in the kitchen, or for grown-up lunches than for our kids’ lunches, but I wanted to shout them out because they’re so awesome. Versatility! These are the most versatile reusable bags I own. They’re made of silicone, so they’re oven, microwave, dishwasher, freezer, and boiling water safe. That means you can use them for steaming veggies, poaching fish, stashing cut veggies, storing a sandwich, freezing smoothie packs, or just about any other kitchen job you can think of! Dishwasher safe – They’re easy to clean. You can put these in the top rack of your dishwasher and they get really clean. I do tend to have to hand dry them, since they’re often still wet inside coming out, but you can absolutely put them in the dishwasher. Variety of sizes – We have these in snack and sandwich size, but I’m planning to pick up a few of the gallon size for putting together freezer meals or freezing leftovers. Made to last. Because they’re silicone, they’re REALLY resilient and made to last. There aren’t any removable parts and it’d be VERY difficult to tear one. They can stain. I hate to say it, but they can stain. I have the clear/white ones, so I’m sure it’s more pronounced because of that, but I’ve tried lemon-water, vinegar, soaking, all kinds of things, but they can still stain if you put something highly pigmented in them (berries, watermelon, etc.). Also, I’ve been hand-washing (and drying!) them, but I’ve still got water spots from my (super) hard water. It doesn’t impact their function one bit, but they aren’t as crystal clear perfect as they were when I bought them, which is a bit of a bummer. They can be hard for kids to open. I don’t pack these in kids’ lunches because they need help opening them, but they’re AWESOME for storing cut/prepped foods in the fridge/freezer, and Michael and I use them for ourselves all the time. Initial investment. These are one of the pricier bags upfront, but are made to LAST. While you’re paying for them upfront, they’ll save a LOT of bags going forward and be around for a long time. Confession: I hate sending my actual utensils to school with my kids. They sometimes accidentally get thrown away or get left behind, they don’t fit well in the kids’ lunch boxes, etc. So, instead of sending plastic ones, we’ve been using wooden/biodegradable ones instead. They’re biodegradable. Since we send/pack lunches every day, I feel better about using these than plastic ones when we need to use them. One container lasts a long time. We don’t send items that need forks/spoons every day, so we don’t go through them very fast. And, if you only want spoons or only want forks, they’re sold that way, too. They are still a disposable item. It’s not a “perfect” eco-friendly solution, but it is a step-up from disposable plastic. 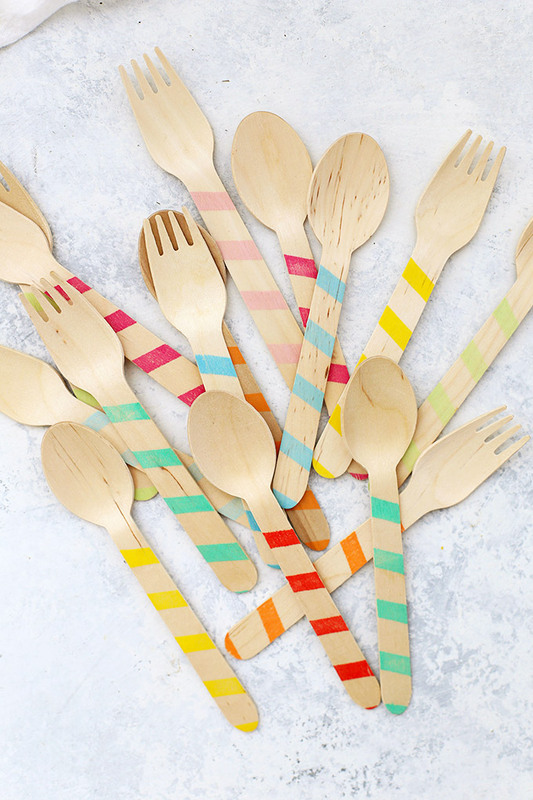 You could also look at getting BPA-free plastic utensils that are washable and reusable. 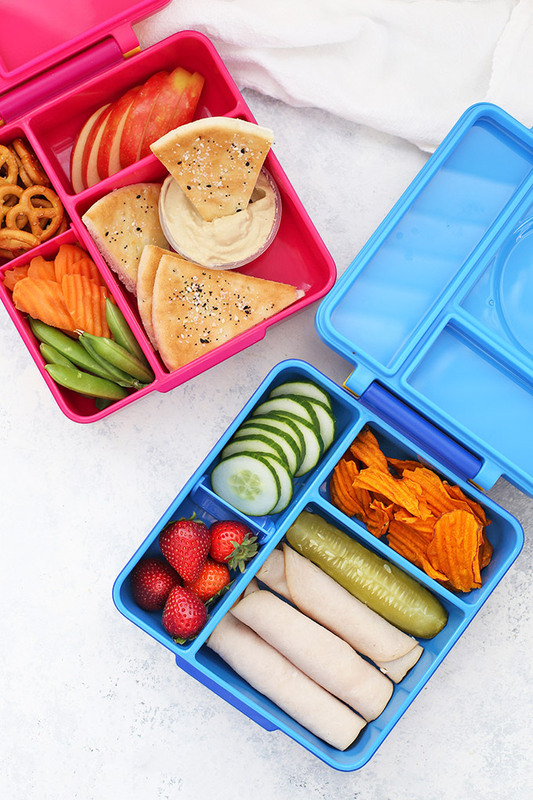 If you’re feeling fired up from finding all the right lunch gear, the next step is to check out 2 WEEKS of lunch ideas and get your FREE PRINTABLE lunch packing cheat sheet that makes school lunches (or work lunches!) a breeze. You can get both right here. And tune in tomorrow for my 5 Hacks for Packing School Lunches! Try putting the silicone bags in the sun to get stains out! Ooh! I’ll try it! Thanks for the tip! I’m so excited for school this year since it’s the first year I’ll get to pack a lunch everyday! I also really love and appreciate how you make me more conscious of my decisions are a consumer in terms of the environment. I’ve always really appreciated that about you. It’s made me think about how I want to have less packaging in my kids lunches this year, and making some of their snacks diy like rice krispies or gummies, so that they’re not putting wrappers in the trash every single day. Emily, I have a potentially really dumb question for you…. I love these lunch boxes you posted about! The Omie ones I’m loving! You said that you need an ice pack with it to keep it cold. Does that mean the compartments aren’t individuallly insulated? If I sent a hot soup in the thermos section and then some cold things in the other compartments… Is that why you pack an ice pack? Sorry i know this is probably over complicating it. 😂 ha! Thank you for all you post! !